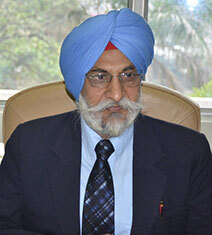 Dr Amarjit Singh Nanda was born in a small village of Kanjali, near Kapurthala, Punjab. He earned his Bachelor’s degree in Veterinary Science and Animal husbandry and Master’s in Veterinary Gynaecology and Obstetrics from PAU Ludhiana. Dr Nanda joined as an Assistant Professor of Veterinary Gynaecology and Obstetrics in College of Veterinary Science, PAU Ludhiana. He completed fellowship of the Royal Veterinary College of Sweden (FRVCS) Sweden in 1983 and Ph. D. from UK in 1989. Dr Nanda rose through the academic ranks to full professorship and served as Head of Department and as the Director for Centre of Advanced Studies in Veterinary Gynaecology and Reproduction, PAU. He gave leadership to applied research in animal reproduction and has the distinction of working as the Regional Expert on Animal Production at the Food and Agriculture Organization (FAO), International Atomic Energy Agency (IAEA) Headquarters in Vienna, Austria. He had been Visiting Professor in Hiroshima University, Japan and University of Sau Polo, Brazil. Dr Nanda has lectured widely as consultant, and has visited more than 35 countries and published 200 papers in journals of national and international repute. Dr Nanda was selected as Animal Husbandry Commissioner Govt. of India, an Additional Secretary rank in the Central Government and served from 2010 to 2013. Dr Nanda joined as Vice Chancellor of GADVASU on 16-2-2015. Before this he also served as Vice-Chancellor of Nanaji Deshmukh University of Veterinary and Animal Sciences Jabalpur, (MP). As the duties of University Vice chancellor has increased manifold, Dr Nanda’s main focus is to serve the farmers through applied research and extension education activities.